Nov 28, 2017. 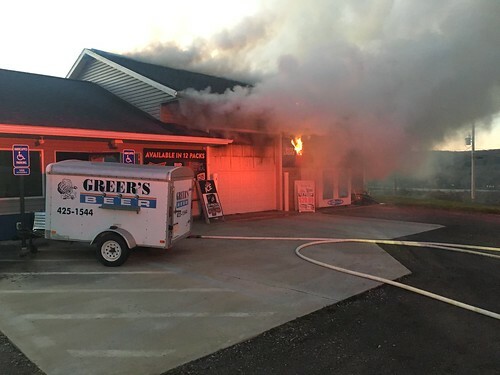 Cochranton firemen responded at 7am to a reported working structure fire at Greer’s Beverage on Rt 322 near Powell Road. Crews arrived to find heavy smoke showing from all sides and fire visible from the front roof area near the garage door. Crews made entry with an 1 1/2 attack line and found the fire had extended into the roof area of the building. A pick up truck that was also in the bay was also heavily damaged by the fire. The roof was vented and interior crews made a good stop on the fire extension to the rest of the building. The building sustained heavy smoke damage through out and fire damage to the bay area and roof. Assisting Cochranton were crews from West Mead 1 & 2, Vernon Central, East Mead, Randolph and Utica. Meadville Ambulance was also on scene. Cause of the fire is under investigation by Cochranton Fire Investigators and State Police Fire Marshall.